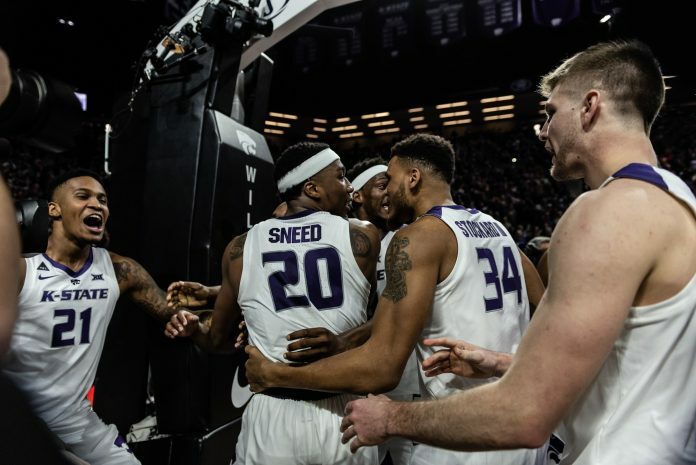 After defeating Kansas on Tuesday, the Kansas State men’s basketball team came up with a crucial 70-63 victory over Baylor in Waco, Texas, Saturday night. The Bears entered the game without leading scorer — and the fourth highest scorer in the conference — senior guard Makai Mason, who averages 16.1 points per game. They were also missing senior guard King McClure, Baylor’s second highest scorer. A 20-point night from senior guard Kamau Stokes helped the Wildcats escape Waco with a much-needed victory. Stokes had plenty of help from senior guard Barry Brown Jr., senior forward Dean Wade and junior guard Cartier Diarra. Brown caught fire and scored 13 points, ten of which came in the second half. Wade was solid against Baylor’s zone defense, scoring 12 points and pulling down seven rebounds. Diarra provided a spark off the bench with ten points on the night. It was a back-and-forth first half between the top two teams in the conference, but the Bears kept a slight edge on the Wildcats leading or keeping it tied for the majority of the half. Baylor opened up in a zone offense, forcing the Wildcats to shoot long shots, but K-State finally broke free late in the second half. K-State took a 31-29 with 22 seconds remaining in the half, first lead since the 12-minute mark. The Wildcats took that 31-29 lead into halftime. K-State shot a 41.9 percent field goal percentage compared to a 48.1 percent field goal percentage from the Bears. Junior guard Xavier Sneed led the Wildcats with nine points in the half, and Baylor’s junior forward Freddie Gillespie led all scorers with ten points on the half. Brown was held to only three points in the half. The Wildcats capped an 8-1 run that began with 1:55 remaining in the first half early on but struggled to pull away from the Bears. Baylor remained in a zone defense throughout the second half in an attempt to shut down K-State. Sneed collected his third foul midway through the second half but continued to get consistent minutes in the half, but a fourth foul with 8:43 remaining forced him to sit until late in the game. K-State struggled to hit shots in the second half, but the defense kept K-State in the ballgame. The Wildcats tied the game again at 51-51 with seven minutes remaining in the game and took a 54-53 lead, the first since 16:43 in the second half. K-State went on a 15-2 run late in the game to seal the game and top spot in the Big 12 conference. The Wildcats hung on to defeat the Bears 70-63 gaining ground on top of the Big 12 and earning an eighth straight conference win, the largest conference winning streak first since 1972. Stokes led all scorers with 20 points on the night including going 7-7 from the free throw line. Junior guard Devonte Bandoo led the Bears with 15 points, and Gillespie scored a career-high 13 on the night. 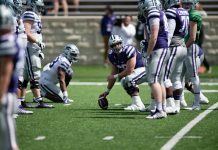 The Wildcats turned over the ball 11 times, a very uncharacteristic statistic for the Wildcats, but only gave up nine points off those turnovers. K-State struggled to contain Baylor in the paint, they were outscored 34-16 in the paint. Baylor finished with a better field goal percentage shooting 44.6 percent but shot only 25 percent from behind the three-point line. K-State escaped by shooting 40.4 percent from the floor and 34.6 percent (9-26) from three. K-State will look to gain more separation at the top of the conference and revenge against the Texas Longhorns on Monday at 8 p.m. on ESPN 2.